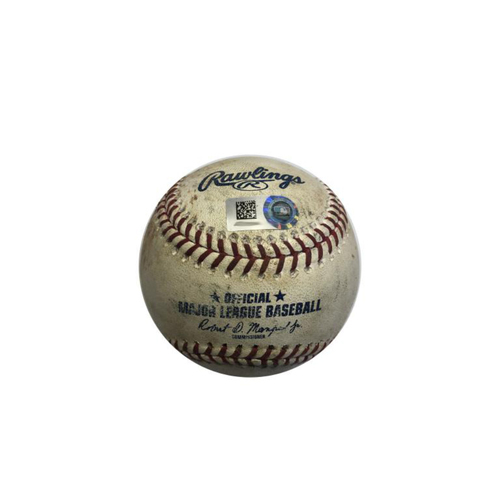 This game-used baseball is from the September 4, 2018 game against the Cincinnati Reds. Cody Reed pitched to Marte, Frazier, and Polanco, resulting in a Marte K, Frazier Double and Polanco Single. These items are authenticated by Major League Baseball and contain an MLB Authentication Hologram. By placing a bid on these items, you are expressly acknowledging the following conditions of this auction: all items are sold "as is." Letters and / or certificates of authenticity will not be issued with items unless otherwise authenticated by Major League Baseball. Memorabilia not authenticated by Major League Baseball is described above in copy and photograph(s) using best reasonable knowledge. Please contact authentics@pirates.com for questions about this item or general inquiries.